It's a very small store and it can get extremely crowded. 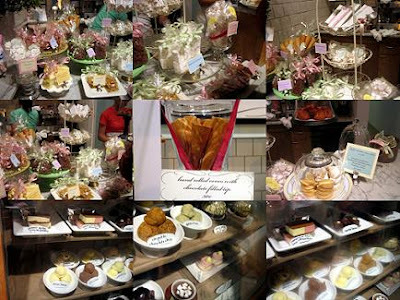 I liked the serene display of their products with a slight hint of elegance. If only they still had some ice cream flavors left! =*( In my opinion the servers weren't that friendly, but I guess it's because it was the end of the night and they wanted to leave... maybe? Still, it would have been nice if they were friendlier. Ms. Lin and I asked to try some flavors and we were not too delighted about the remaining choices. We went with a random choice of Brandied Cherry and Sesame Praline. 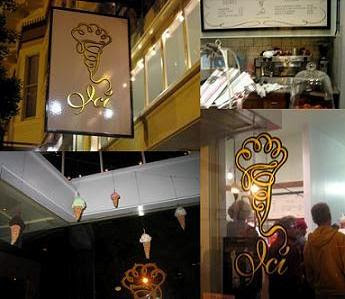 Originally we were going to each get our own cones with 3 scoops each. =*( Normally I don't like cherries in my ice cream, but the texture of the ice cream was very creamy and it did have a lot of cherries. The flavor was not bad, but I am not sure I would wait 30-45 minutes for ice cream let alone drive to East Bay. At first we didn't like the Sesame Praline because it had a strange orange taste and the flavor was all over the place. As I took more bites, I started liking it more and more. There were chunks of Sesame Pralines distributed throughout to add a crunchy texture and lingering flavor in your mouth. On the bright side, the cone was spectacular. It's like a delicious & airy wafer rolled up with chocolate in it's tip to prevent any leakage. I decided to get a Hazelnut Ice Cream Bon Bon since I love the taste of hazelnuts. It's a small square of ice cream enveloped in chocolate with half a hazelnut atop. The nut was good and the chocolate was sweet, but the ice cream was only okay for me. It lacked a strong flavor and wasn't too sweet. I felt that the ice cream was a little icier and not as creamy as the scooped ice cream. Ms. Lin and I both wanted to try their ice cream sandwiches that people on the internet just rave about. Unfortunately, we don't like the same flavors so we each got one. Ms. Lin tried the Meyer Lemon & Strawberry Ice Cream Sandwich with Chocolate Cookies. The cookies were nice and crunchy. They didn't become soggy even when the ice cream started to melt. As for the ice cream inside, I wasn't that big of a fan. I don't really like Meyer lemons, so I think that played a part. The Meyer lemon flavor was very strong and it overpowered the strawberry flavor. You would think the sourness of the lemon would bring out the sweetness of the strawberries, but it didn't. The strawberries were very light and also had a sour flavor, which shows that they make these ice creams from fresh ingredients. I ordered the Peanut Butter Ice Cream Sandwich with Chocolate Cookies. The flavor of the peanut butter was very light and almost unnoticeable. I really love the rich flavors of peanut butter, but the ice cream here fell very short. It was just a light flavor that brought out the flavor of the cookie more. I guess a good thing would be that you don't feel weighed down after eating these and the cookies were tasty. The treats they sell at the counter looked very inviting so Ms. Lin and I each picked up an extra sweet. Ms. Lin chose their Saffron-Orange Blossom Marshmallows because she loves homemade marshmallows. They looked delectable, but they taste like soap! Bleh! The texture was nice, but the flavor combo was totally off. I'd rather try the peppermint flavored marshmallows. For my sweet, I chose Rose Pistachio Meringues. I love pistachios and meringues, so I thought the combo would be good. It was an odd mixture as well, but at least it didn't taste like soap. The meringue was a little too tough and after you start chewing it becomes extremely sticky in the mouth. The flavor was tolerable, but I didn't enjoy the process of eating it.